The Boosta Grande™ clean boost is back in a new compact chassis to conserve space on your pedal board. But some of you may be wondering just what the purpose of the Boosta Grande™ is and why it is so cool that it received the Guitar Player Editor's Pick Award. Well, we're glad you asked because Nick Jaffe just posted a great demonstration video of the Boosta Grande™. Nick uses his killer G&L Fallout™ along with BBE pedals including a Blacksmith™ analog distortion, 427™ Distortion, Two-Timer™ analog delay and Soul Vibe™ rotary simulator to show you nearly every possible use for the Boosta Grande™. You gotta check it out! About the BBE Boosta Grande™: The Boosta Grande™, a Guitar Player Editor's Pick, is back in a new compact chassis to conserve space on your pedal board. A clean boost pedal does nothing but pile on gain, right? Well, some do, but that doesn't create the experience players want. You see, added gain will push the amp's front end tubes harder, creating more of the amp's own harmonics, but that alone will make the amp seem too bright, sacrificing the tonal balance in the process. 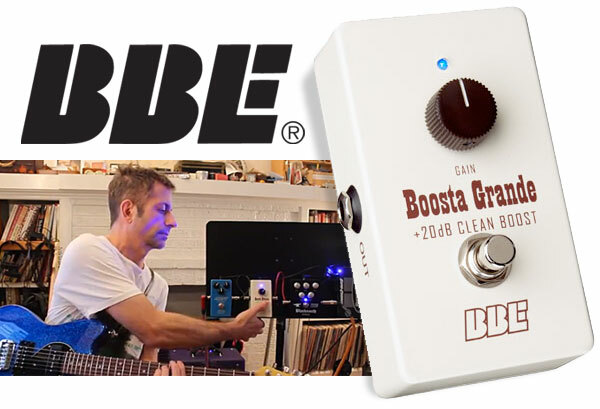 You see, we call Boosta Grande™ a "transparent clean boost" because it doesn't change the tonal balance of the amp, even with Boosta's max gain of +20dB slamming those tubes. To achieve a transparent boost experience, Boosta Grande™ mildly rolls off some top end starting at about 1kHz so that when the amp's front end is driven harder with gain, the additional upper harmonics generated by the tubes aren't excessive. Boosta Grande's mission to preserve amp amp's tonal balance ends with careful post-EQ, but it starts with preserving the tone of your guitar. Boosta Grande's 1meg Ohm input is about the same as the front end of a good Marshall or other premium tube amp, welcoming your guitar's signal with wide-open arms, not loading down your pickups. In the middle of things, you can count on Boosta's 1% metal-film resistors for consistent tone and a rugged circuit board for tour-proven reliability. When the Boosta isn't engaged, a properly engineered true hardwire bypass means signal passes entirely around the circuit, from input jack to output jack without a hint of loading. When a transparent boost is the experience you're after, get a Boosta Grande™ and let your amp's tubes sing their song with more gusto.